Rather than bounce from website to website trying to track down the latest in the social media world, check out this infographic. It shares important findings from the industries’ top social media studies. 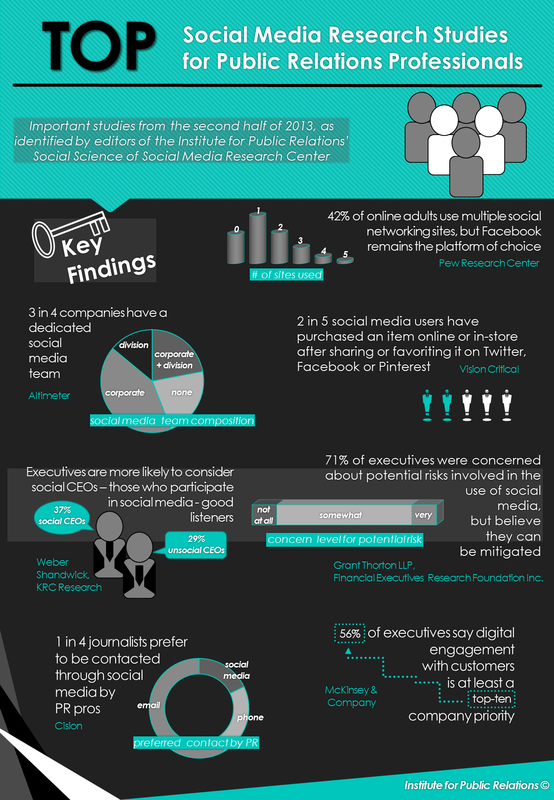 Every year companies, research centers, news outlets and everyone in between conduct studies about social media. All of these studies are interesting and helpful, but it can be hard to keep up with the findings. Lucky for us, the Institute for Public Relations compiled a list of social media studies and put interesting findings from each of them into an infographic. Three in four companies have a dedicated social media team. Executives are more likely to consider CEOs who use social media to be good listeners. More than 50 percent (56 percent) of executives say engaging with customers online is one of their companies’ top 10 priorities. Forty-two percent of online adults use more than one social network. Facebook is the most popular. For more social media statistics, check out the full infographic below.